If we were to pay heed to our culture's fear-mongering voices surrounding carbohydrates, we might as well slap a photo of rice or pasta atop Harry Potter's face underneath the heading Undesirable No. 1. It's pretty much impossible to argue our society hasn't reprimanded the macronutrient to the point of creating unnecessary—and dare we say harmful and unhealthy—fear, avoidance, and misinformation about the food group. After all, supplementing our bodies each day with enough carbohydrates is essential to feel our best and, you know, life in general. This is especially true for women. Sorry to break it to you, but it's proven that men fare much better on low-carb and/or keto diet plans than women do—something about that whole reproduction and menstrual thing we do each month. While low-carb and ketogenic diets are very much en vogue at the moment, they may not be helpful for women in the long run. As Lara Briden, ND, explained to me last year, complex carbohydrates (which experts unanimously dub the healthiest) have many positive benefits for women—especially when it comes to our hormone and period health. In addition to being an essential source of energy, the healthiest carbs can support our immune function, thyroid health, and nervous system (preventing spikes in cortisol) and contain important soluble fiber, which Briden says fuels the gut bacteria and promotes healthy metabolism and the essential detoxification of estrogen. Of course, certain carbohydrates are healthier, more strategic options than others when it comes to optimizing your health and energy levels, so we consulted multiple experts to find out the carbs they think are the healthiest—and why. Plus, we went ahead and asked them pretty much every other carb-related question that's ever crossed our minds or the dinner table. 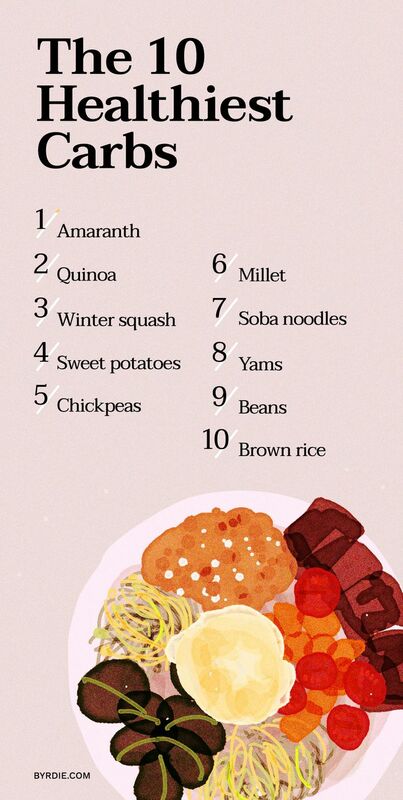 Keep scrolling for our nutritionist-curated list of the 10 healthiest carbs (feel free to pin away!) and everything else you need to know about the largely misunderstood food group. 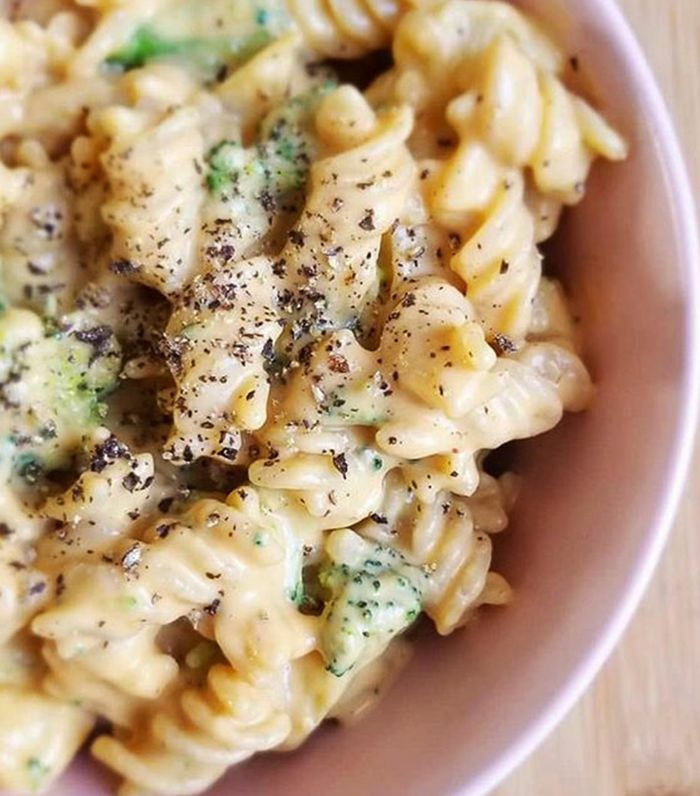 You've likely heard it before, and goodness knows we sound like a broken record with this one, but getting our daily supply of carbs from real, whole food sources (which will naturally be chock-full of vitamins, minerals, and fiber) is the best rule of thumb when considering which starches to fill your plate with. In fact, we often forget some of our favorite vegetables and fruits like kale, collard greens, cabbage, tomatoes, berries, and Brussels sprouts are rich in carbs in addition to an ample serving of antioxidants. Therefore, consider, supplementing the list above with even more colorful sides, which will keep you full, energized, and extraordinarily glowy. "There are three different types of carbohydrates: complex, simple, and fiber," clarifies Kimberly Snyder, celebrity nutritionist, best-selling author, and founder of new wellness and lifestyle brand Solluna. "Complex carbohydrates (known as starches), include whole, unrefined grains, and fiber. Simple carbohydrates, (also known as sugars), provide the body with fast energy and include refined starches, sugar, as well as fruits. The refinement process not only removes the fiber but the majority of minerals, vitamins, and nutrients from the grain as well. Lastly, fiber is a type of complex carbohydrate that can't be digested by the body." Snyder explains that the key to healthy carb intake is imbibing the correct high-quality forms, and she personally supplied the list of the 10 above, which are filled with slow-burning fiber, vitamins, and minerals—the perfect equation for energy and satiety. Because surprise! We're all unique react individually to all different kinds of foods. So while the above list is nutritionist-approved and a great place to try experimenting with which carbs your body likes and tolerates the best, it might not be that black-and-white—just some food for thought. Use this list as your starting point! "Bio-individuality matters when it comes to carbs," says Diane Sanfilippo, certified nutrition consultant and author of the upcoming cookbook Keto Quick Start ($28). "For example, one person may feel great eating a banana while another may feel lethargic from the same fruit. One person may not digest high-fiber raspberries well, and someone else finds them to be a perfect food. Our bodies can respond to carb-rich foods differently, but for the majority of what you eat, focusing on real, whole food–based carbs is ideal for everyone." Of course, even if you're choosing nutritionist-recommended carb sources, it's still essential to mind the amount you fill your plate with. One key strategy Snyder swears by? Adding your veggies first, and then go in for the carbs. Filling more than half of your plate or bowl with leafy greens and other vitamin-rich vegetables is a natural (non-restrictive) way to maintain control of your ratio of carbohydrates. But again, we're all different, and some of us require (or just feel better) eating more carbohydrates than others. Again, there isn't a certain prescription for this, so it will take some trial and error. Tune into your natural hunger and fullness cues, and pay attention to when you feel the most energized and/or lethargic. "While some people feel best eating a very low-carb diet (or following a ketogenic diet), some feel better with more carbs on their plate," confirms Sanfilippo. Ideally, she says, it's best to serve carbs along with a high-quality protein and a healthy source of fat. Her ideal? If you do better with fewer carbs, try pairing a piece of wild-caught salmon with some cauliflower rice and a big green salad. Or if you do better with more carbs, swap in a baked sweet potato in lieu of the cauliflower rice. A biggie? The idea that eating carbs will automatically lead to weight gain. "Carbohydrates are an important macronutrient which can and should be included in our diets," Snyder confirms. "However, sticking to gluten-free varieties and soaking and sprouting grains for easier digestion and removing lectins are ways to maximize the nutrition from eating grains. We need not fear them!" In fact, many restaurants (including the ever-popular salad spot Tender Greens) have even started serving sprouted versions of grains on their menus. "We serve sprouted brown rice (which is higher in protein and easier to digest than pre-sprouted rice), quinoa (gluten-free and high in protein), bulgar and farro (whole grains loaded with fiber, vitamins, antioxidants and tons of flavor)," CEO Denyelle Bruno says of the restaurant's choice. "The biggest carb-related myth I come across as a nutritionist is that everyone needs to eat carbs, or no one should eat them," adds Sanfilippo. "Dietary dogma in either direction is tricky, but the truth of the matter is that everyone can feel better eating less sugar and fewer refined-carb foods overall. Shop the perimeter of the grocery store and buy mostly fresh foods like meat, eggs, seafoods, vegetables, fruits, and nuts and seeds. From there, the rest can be determined through trial and error and finding what feels best for you over time!"